Kanjurahan written in the inscription in 760 AD, now it has changed into Kanjuron (a place near Dinoyo). Balandit, written in the inscription in 929 AD, now it has changed into Belandit (a place in the Eastern part of Singosari). Panawijyan, written in the inscription in 943 AD, now it has changed into Polowijen, the name of a Ward Administrative Unit in Malang Municipality. Hantang, written in the inscription in 1135 AD, now it has changed into Ngantang (45 km West of Malang). Katinden, written in the inscription in 1395 AD, now it still uses that name up to the present time (15km North of Malang). Mandragiri, written in the Javanese History Book "Negara Kertagama ", is the name of a hill that is now known a "Mandaraka", it belongs to Singosari Sub District (7 km North of Malang). A part from the above references, there are still many other references supporting the history of Malang such as: the name of hills, rivers and archeological remains (temples, stupas, gates, and many others). Kanjuruhan Kingdom, 8th century AD that was centered around Dinoyo now. 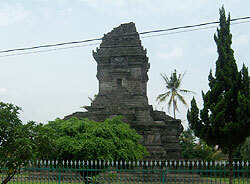 Singosari Kingdom, 13th century AD that was centered around Singosari Sub District now. We found the central government activities along the Brantas river. We found the other central activities at the other places in Malang. The growth of Malang Regency population is the result of the historical process, from 8th century up to now. The day of Malang Regency born was closely connected with the time when the oldest central government was found in Malang. Apple tree in Indonesia (especially in Malang) began to be known about the year 1908 before the independence of Indonesia being proclamed. The Ducth was the first people who brought, AND REACHED GOOD AREAS FOR APPLE GROWING. Malang is one of them, and above all it is the most suitable. The first apple variety grown in Malang was Rome Beauty. About 1969, after twenty four years, Indonesian got its independence, the " Banaran Garden Institution" found a new apple variety, namely Manalagi Apple. The man who found it was Mr Surachmat Kusumo, a senior fruit tracker from Balai Penelitian Hortikultura Pasar Minggu (Hortikultura Reseached Institution Pasar Minggu) Jakarta This new variety was from Gandon Village, because this variety was not found in Holland and other parts of the world. so this variety was finally considered as an Indonesian Apple. And because of it nice taste, this apple is named Manalagi (In Javaneses language, "Manalagi" means "give me more "). Specification: Manalagi Apple = Mokus Sylves Tris Mill Color: Skin = Whitish Green or Greenish White Meat = White Taste, sweet good and nice smell. Salaca, a special kind of tropical fruit produced at the village of Suwaru for the first time, then popularized around the village and its surrounding, now it has been well-known by the name "Salak Suwaru ". We can find this fruit not only in Malang, but also in Surabaya, Mojokerto, Kediri, Jember, Gresik, Banyuwangi, and many other cities in East Java. This fruit has a special taste, good aroma (good smell) and, of course, it's very nice. The location of Agribusiness Salaca Group is addressed at Suwaru Village, Gondanglegi Sub District (about 25 km away to the South from Malang), Phone (0341) 879451.